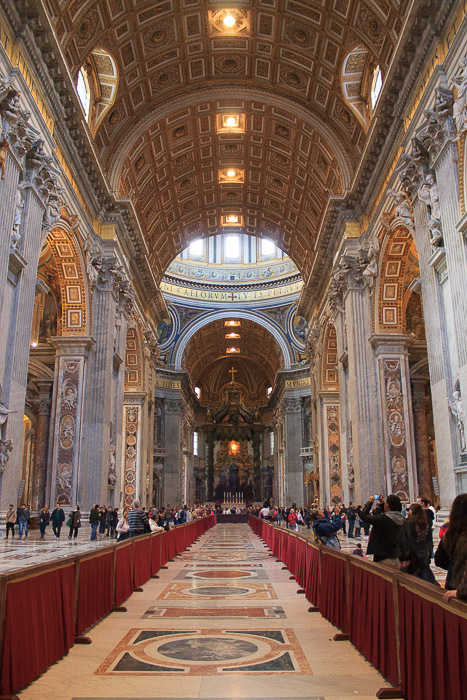 St. Peter's Basilica is one of the holiest of Catholic sites and has the largest interior of any Christian church in the world. According to the Catholic church, the original church on this site built by Constantine during the 4th century, and the site was selected such that the altar of the church was over the tomb of Saint Peter, the apostle of Jesus, who had been crucified in the Circus of Nero which was once just outside the bounds of this church. 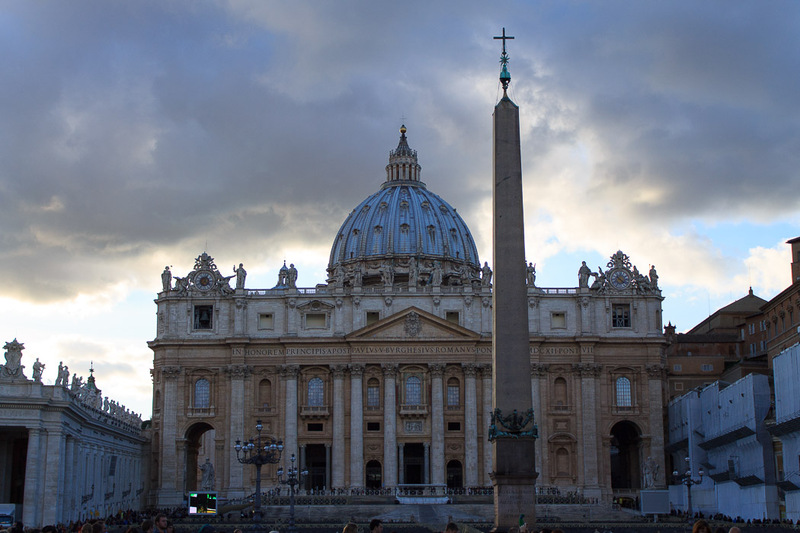 A tour of St. Peter's tomb and the necropolis surrounding it is offered as the Vatican Necropolis tour. Construction of the current church, built over the church built by Constantine, began on April 18, 1506 and was completed on November 18, 1626. It is regarded as one of the greatest works of architecture of its age, and is associated with the artists Michelangelo and Bernini. It is not a cathedral since it is not the seat of a bishop, but is one of the four churches in Rome that are part of the Vatican, along with Santa Maria Maggiore, St. Paul's Outside the Walls and San Giovanni in Laterano, which is the cathedral of the Bishop of Rome, otherwise known as the Pope. The dome of St. Peter's Basilica, designed by Michelangelo, dominates the skyline of Rome, being the tallest building in Rome. It stands out from the rest of the skyline from most of the high spots of Rome, like the Pincian Hill, the Victor Emmanuel Monument, and the Quirinal Hill. 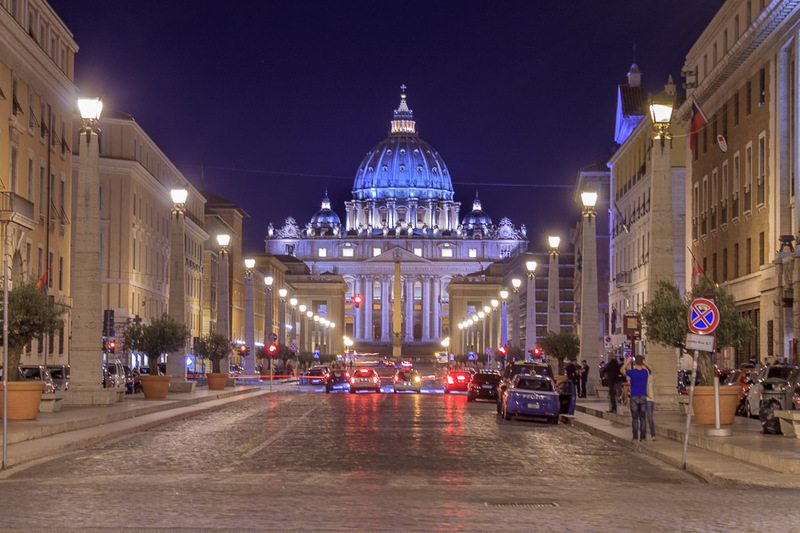 A spectacular view of the surroundings of the church, and of Rome in general, can be had if you walk the steps up to the top of the dome of St. Peter's. To enter St. Peter's Basilica, or walk up the Dome Walk, or go through the Vatican Museum, you must dress such that your shoulders and knees are not exposed; shorts are prohibited. The top of the facade of St. Peter's Basilica has two clocks and several sculptures. The clocks were created to replace Bernini's bell towers which had to be torn down due to insufficient support. The left clock shows Rome time, the one of the right shows European mean time. The statues are Christ the Redeemer, St. John the Baptist and 11 Apostles. From the left: St. Thadeus, St. Matthew, St. Philip, St. Thomas, St. James the Greater, St. John the Baptist, The Redeemer, St. Andrew, St. John the Evangelist, St. James the Lesser, St. Bartholomew, St. Simeon, and St. Matthias. On the left side of the interior of the portico is an equestrian statue of Charlemagne, shown in the 1st photo below. 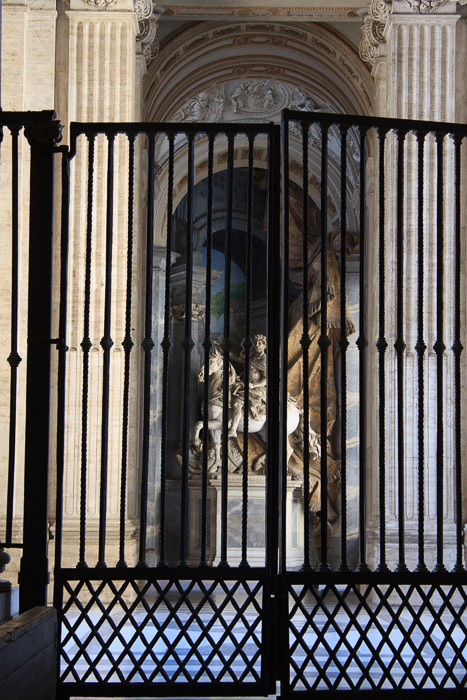 Although it would have been simple for them to allow me walk ahead 20 feet to put my camera between two bars of the gate to get an unobstructed picture, officials of the church forbade me to do so, resulting in this terrible picture. 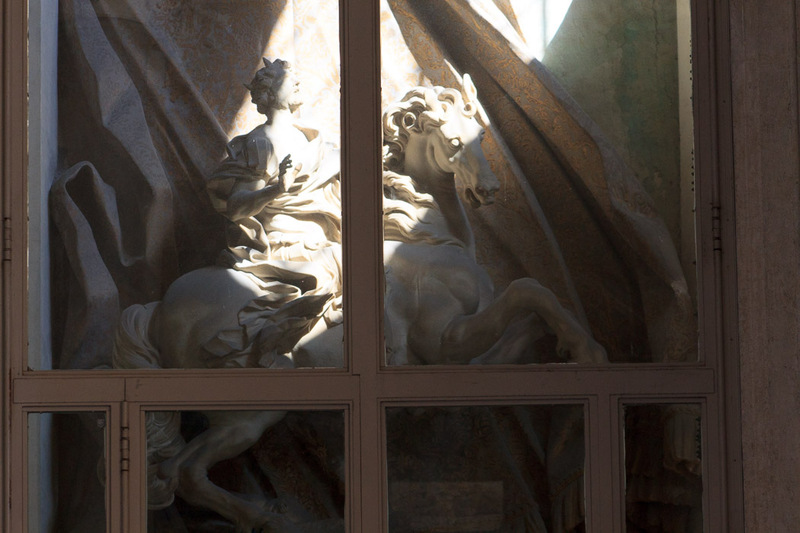 On the right side of the interior of the portico is Bernini's equestrian statue of Constantine. Again, officials prohibited me to get closer to get a decent photo. I guess if you're loaded with money and can afford to but great artwork, you can also afford the guards to keep people away from it. 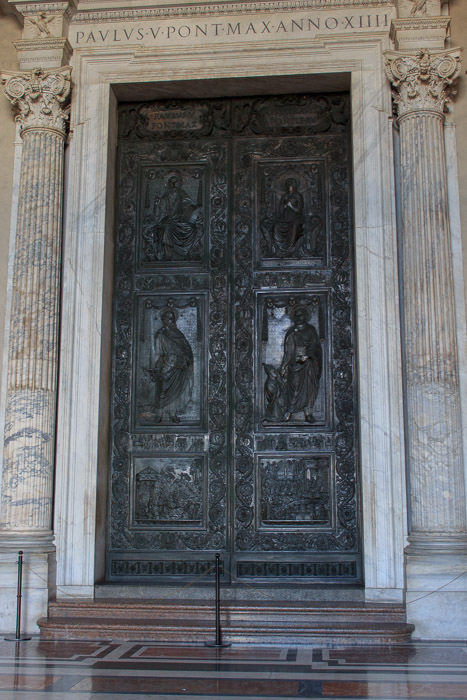 One of the doors to the basilica is called the Holy Door. It is locked and normally not usable, except is opened by the Pope on Christmas Eve every 25 years. 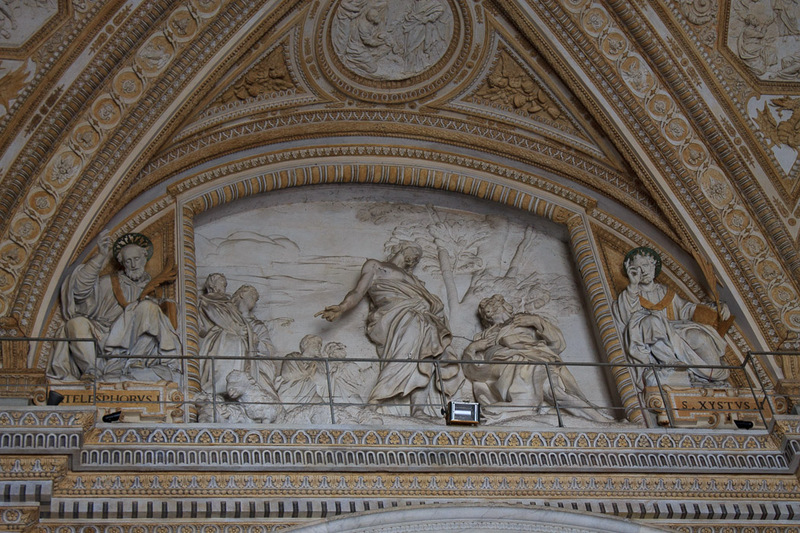 Above the central doorway is Bernini's Pasce Oves Meas (Feed My Sheep). The Gospel of John records that in a postmortem appearance to his disciples as the Good Shepherd, Christ assigned to Peter the task of nurturing his mystical flock. The episode was universally interpreted as the institution of the Church with Peter and his successors at its head. The work thus illustrates the historical and divine sanction for Christianity and the authority of the popes. When you walk through the door into the church, you'll see that its absolutely huge. The babies at the base of the pillars along the main corridor (the nave) are similar in size to you. The gold lettering above the columns is 7 feet tall. 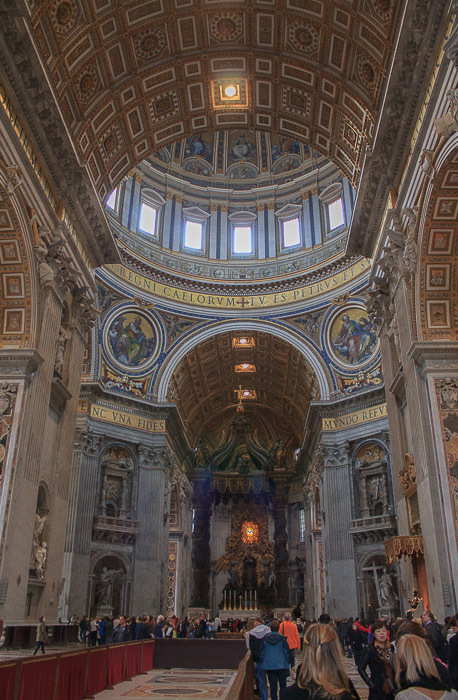 The fancy bronze canopy (called the Baldacchino) way down the nave above the main altar is 7 stories tall. But much of the decoration of the church is designed to make the church see a bit smaller and more accessable. 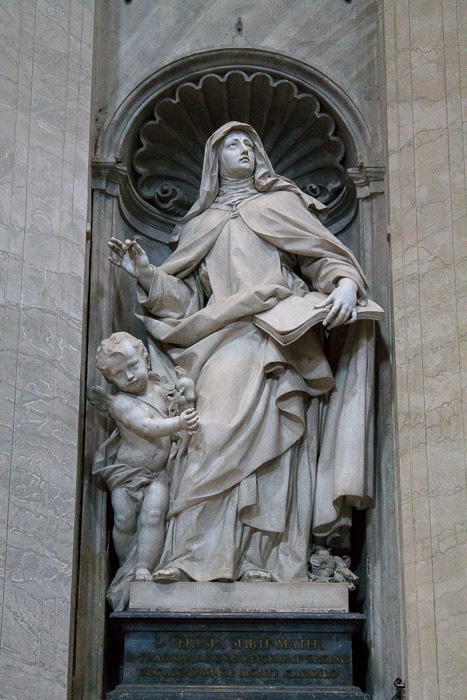 For example, the first column on the right has a 15-foot-tall statue of St Teresa of Jesus at the bottom (2nd photo below). But the statue of St. Madeleine Sophie Barat at the top of that column (3rd photo below) is 22-feet-tall, making her feel closer than she really is. And just have a look at those fancy Corinthian capitols on either side of her! With angels just outside those capitols. Wow they knew how to decorate this place to the max! Backtrack just a bit to the round maroon slab of porphyry stone in the floor behind the first set of columns (1st photo below). That's the spot where the French king Charlemagne was crowned Holy Roman Emperor on Christmas night of 800 AD. Now go ahead and walk to that fantastic altar way down toward the front of the church. As you approach you'll see that the great dome designed by Michelangelo is directly above that bronze 66-foot-tall baldacchino designed and built by Bernini from 1623 to 1634 (2nd photo below). The top of the dome is 448 feet above the floor of the basilica, and it is a great experience to take an elevator to the walkway between the letters and the windows at the bottom of the dome, then walk up a spiral stairway between the inner wall and outer wall of the dome up to the top of the dome where you can enjoy breathtaking views of St. Peter's Square and of Rome. 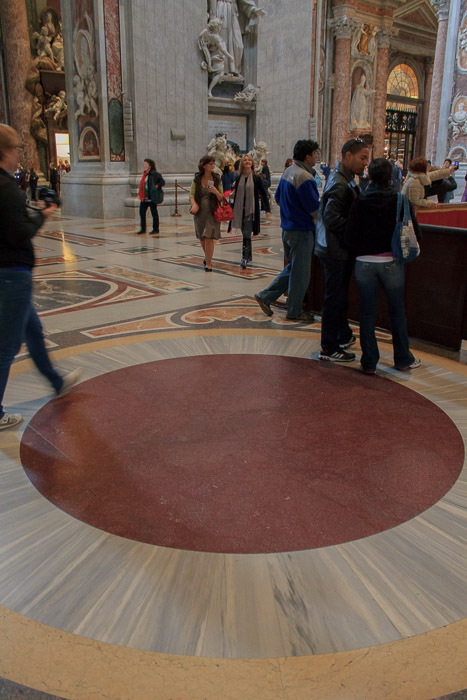 Directly under the dome and the baldacchino and the floor is the burial site of St. Peter. The bronze for the baldacchino came from Venice, not from the bronze stripped by Pope Urban VIII from the Pantheon which was instead used to make 80 cannons for Castel Sant'Angelo. Each bronze column was hollow-cast in three pieces, then joined together and filled with concrete to increase its compressive strength. The canopy is also made of bronze, with bronze tassels, so it looks ephermeral but is actually quite durable. The Confessio is the sunken chapel in front of the altar (1st photo below). Behind the glass at the back of the confessio (opposite the stairs) is the location of the grave of St. Peter, not visible here, but 23 feet under the marble floor of the basilica. Surrounding the main altar are four huge pillars which support the dome. 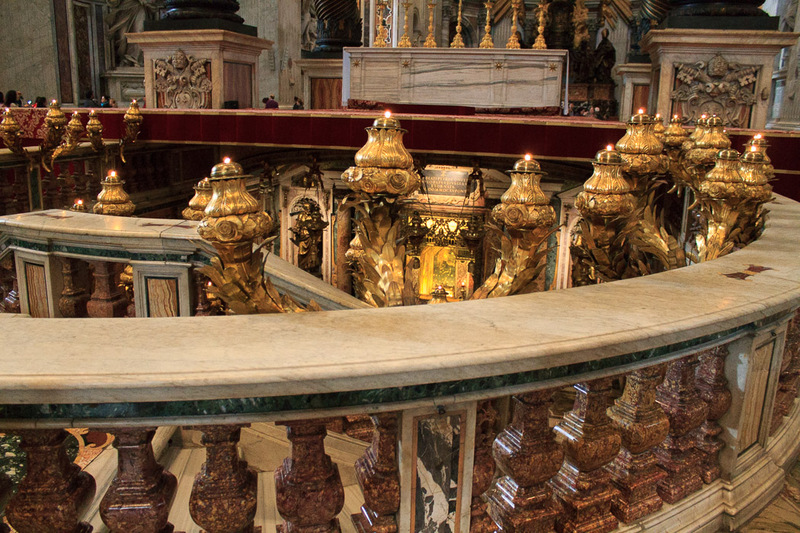 In the top half of those pillars are marble spiral columns which stood over the tomb of St. Peter and the altar in Constantine's original Basilica of St. Peter; they inspired Bernini to create the spiraling columns of the baldacchino (2nd photo below) in the current St. Peter's Basilica. 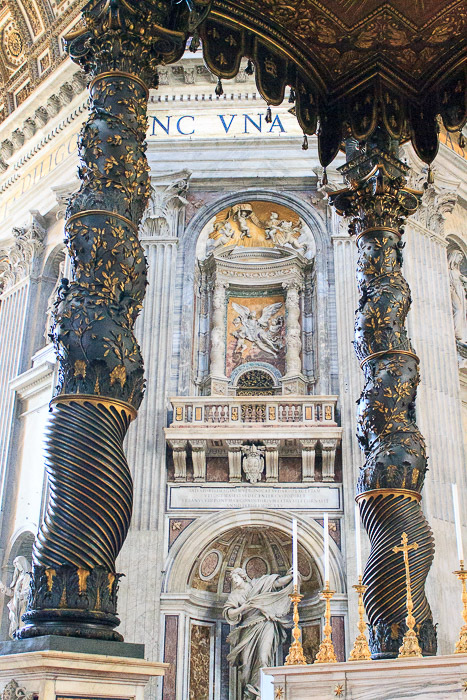 The balconies that incorporate those original corkscrew columns were designed by Bernini. Some of those corkscrew columns might have been looted by the Romans from the Temple of Herod in Jerusalem. The baldacchino and Michelangelo's dome are shown in the 3rd photo below. Michelangelo's dome is shown in both photos below. 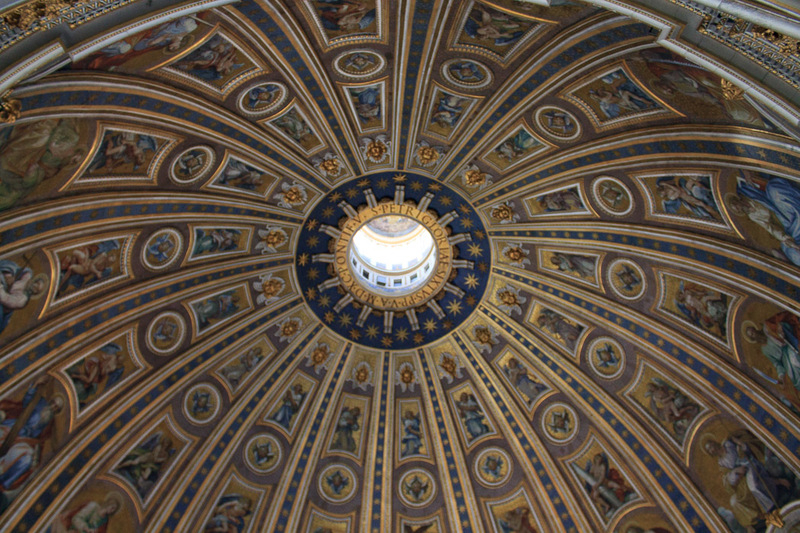 The 1st photo was taken from the floor of St. Peter's Basilica, and the 2nd photo below was taken from the walkway around the base of the dome, between the tall letters and the windows near the bottom of the dome, after riding the elevator up to that level, the half-way point on a trip to the top of the dome. The dome was designed by Michelangelo, but when he died in 1564 only the round base as far up as the windows had been completed. The construction continued after his death to his plans. The inside was painted, of course, by others, with Jesus, Mary, a ring of saints, another ring of angels, and the central image of God the Father. 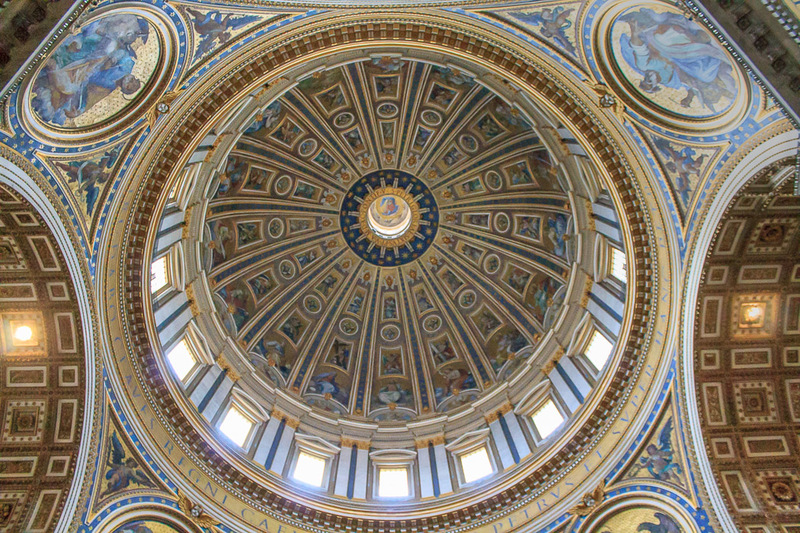 The 7-foot-tall words around the bottom of the dome are from Matthew 16:18, when Jesus said to Peter, "You are Peter and upon this rock I will build my church, and to you I willl give the keys of the kingdom of heaven". 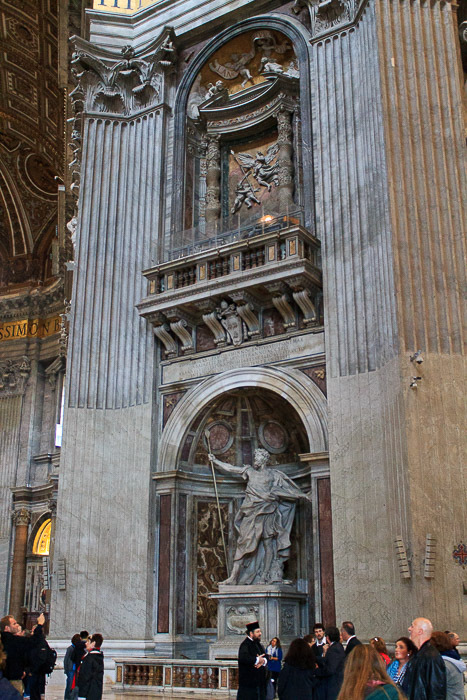 Going back to those four pillars, the pillar on the right in front of the altar has a bronze sculpture of St. Peter (2nd photo below) which came from the original St. Peter's Basilica of Constantine's. The big toe on his right foot has been worn smooth by the lips of people who have kissed that toe over the ages. 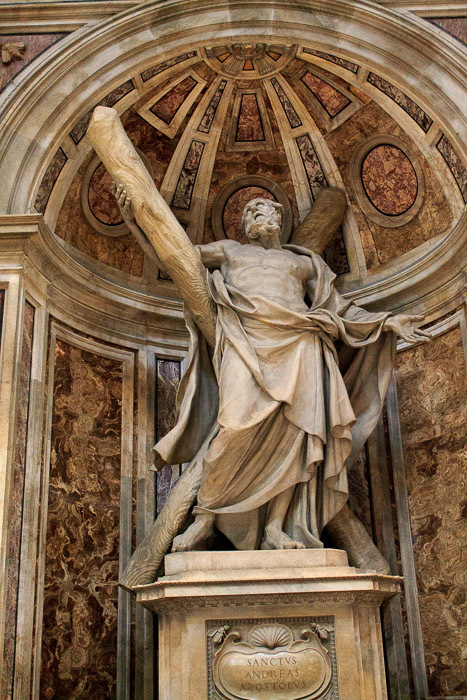 On that same pillar, on the side facing the altar, is Bernini's 1635 sculpture of St. Longinus (1st photo below), who was the Roman centurion who pierced the side of Christ with a lance while Christ was on the cross, and converted to Christianity after experiencing the darkness after Christ's death. 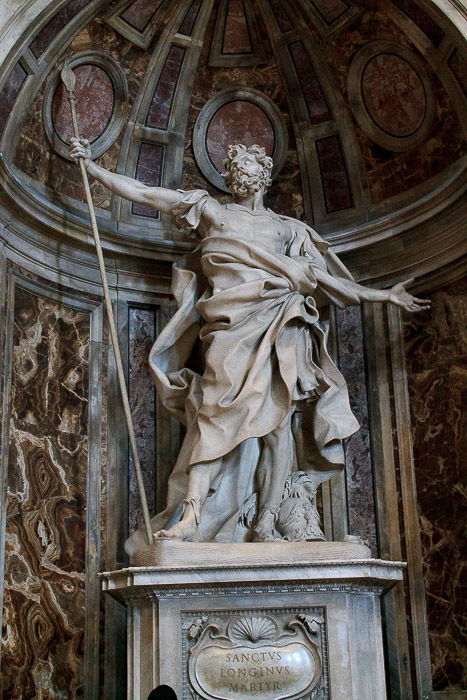 Just like Bernini's David, in the Borghese Gallery, St. Longinus is in action, with his muscles striated, making the sculpture more three-dimensional and realistic. 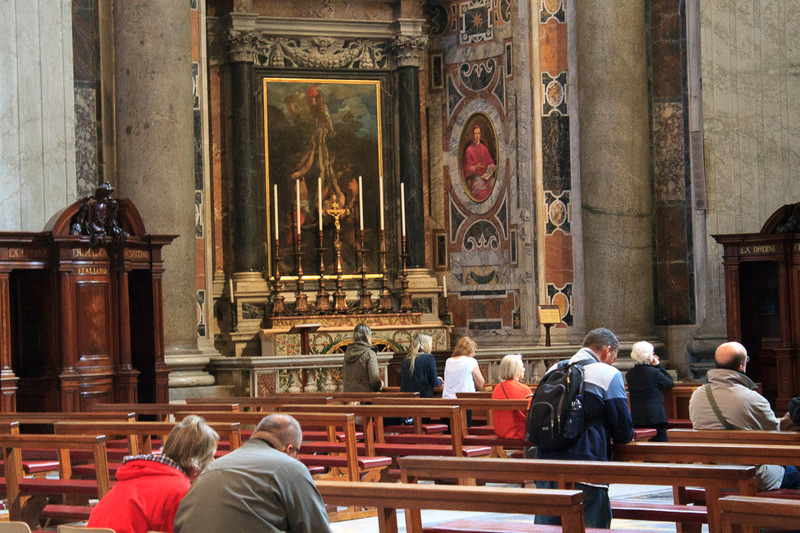 He looks toward the altar, directing the viewer's attention back to the focus of the church. On the altar-facing side of the pillar on the left-front of the altar is a stulpture of St. Andrew (3rd photo below), the brother of St. Peter, who was the Christ's first disciple. 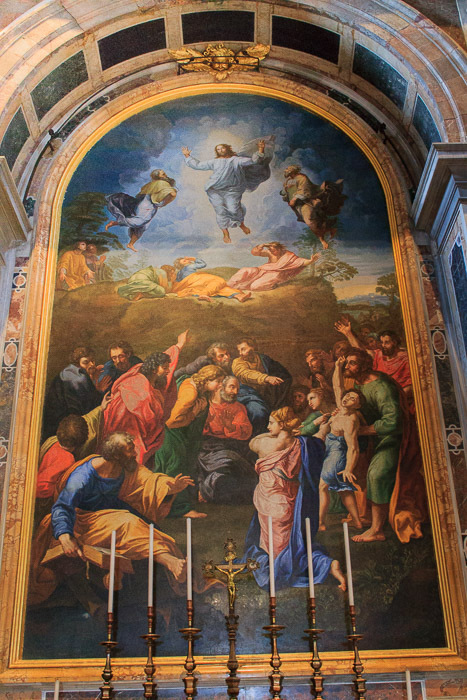 On the side of the St. Andrew pillar which faces the front door where you entered the church is a mosaic copy of "The Transfiguration" by Raphael (1st photo below). Head back to the altar and go to the far left of the basilica, to the chapel area at the end of the left transept. Inside that chapel area you'll see the Altar of the Crucificion of St. Peter (2nd photo below). 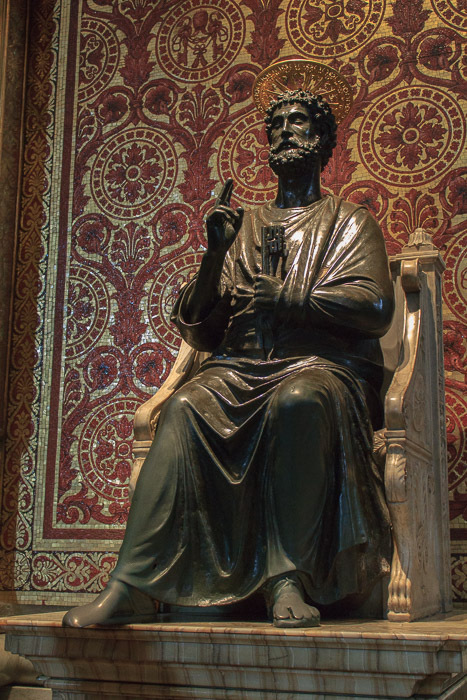 St. Peter had come to Rome to spread Jesus' teachings to the pagan Romans. During the reign of Nero he was arrested and brought to Nero's Circus for execution. St. Peter wanted to be crucified upside-down since he saw himself unworthy to be crucified in the same way as Jesus Christ. The spot where this altar stands is the spot within Nero's Circus where Peter was crucified. And he was buried across the street (at least, it used to be a street), under what's now the high altar of St. Peter's Basilica. The Vatican Obelisk, now in front of the church in the center of St. Peter's Square used to be in the spina of Nero's Circus, and the spot where it stood is marked in the pavement outside the church, in a restricted area on the left side of the church (see my Vatican Necropolis page). Next go to the back wall of the basilica, directly behind the high altar (1st photo below). 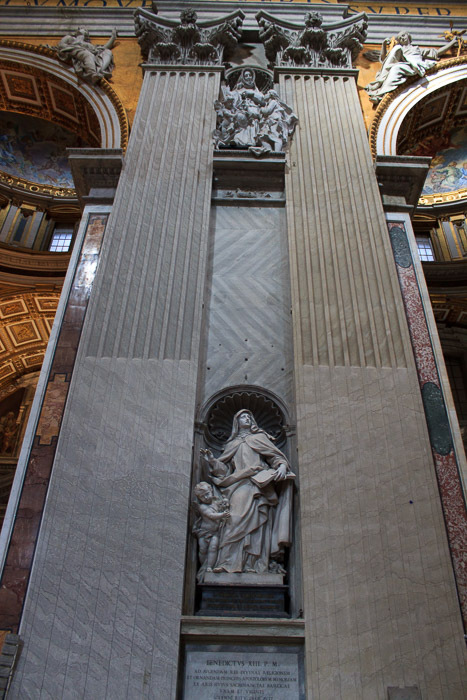 High up on the wall is Bernini's Gloria, with the Dove of the Holy Spirit at the center of 12 rays which symbolize the 12 apostles. 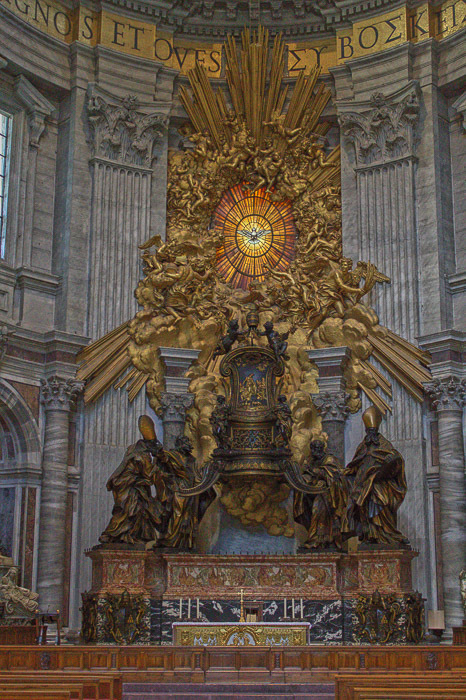 Below and in front of the Gloria is the Cathedra Petri, or "throne of St. Peter", which is an oak chair dating from the 12th century housed in a large throne created by Bernini and held up by four massive bronze statues. The throne is made of red jasper, black Sicilian marble, bronze, gilt, stone, iron, marble statuary, yellow glass, and golden stucco clouds. 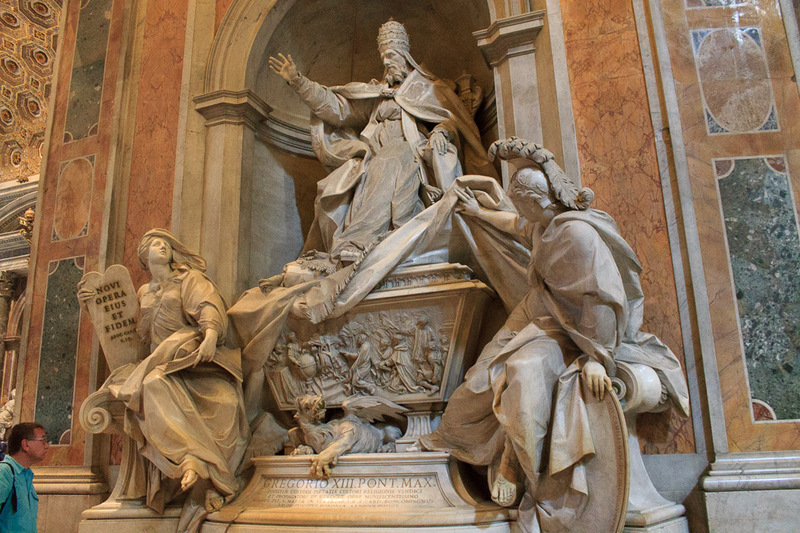 Just to the right of the Gloria on the back wall is Bernini's "Monument to Urban VIII", the pope who forced Galileo to recant (2nd photo below). 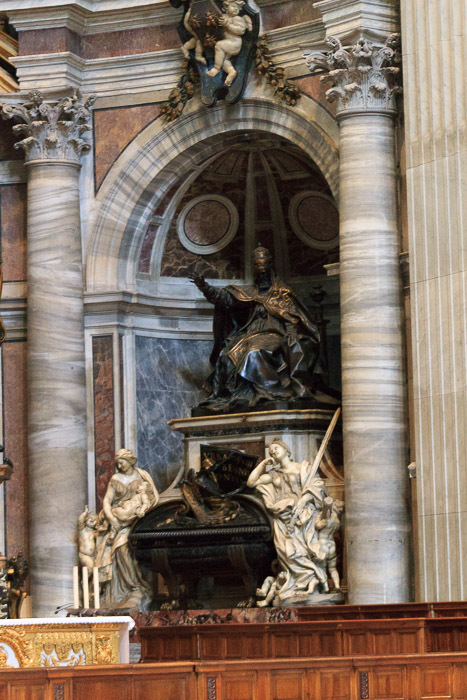 To the left of the Cathedra Petri (the throne), in line with the large pillar, is Bernini's spectacular "Tomb of Alexander VII" (1st photo below). This is a favorite of mine because of the varied colors of stonework, and the drapery of material hanging down over the doorway, and the skeleton near the bottom. This is one of Bernini's last major sculptures, completed at age 80 in 1678, two years before his death. Alexander kneels in prayer at the top. Below him are four females representing virtues practiced by the Pope. Left foreground is Charity with a child in her arms. Right foreground is Truth, whose foot rests on a globe, directly over England where Anglican religion was being practiced. Behind are Prudence and Justice. The skeleton, a figure of death, raises an hourglass to symbolize that time has passed. Now head back toward the pier of St. Longinus (right-front of the altar). The entire pier is shown in the 2nd photo below, showing twisted columns from the original St. Peter's Basilica of Constantine in the upper half. Head down the aisle on that side of the nave toward the entry doors of the church. The chapel on that side of the nave is the Chapel of the Sacrament, which is used for prayer only. 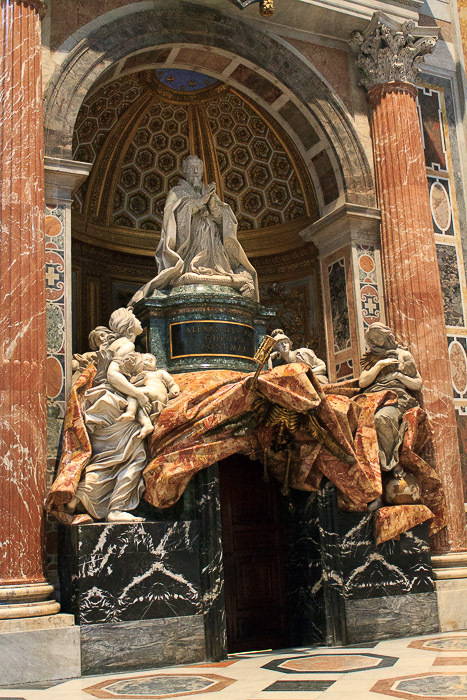 If you can catch a glance inside you can see Bernini's Altar of the Sacrament, a tabernacle of gilded bronze. 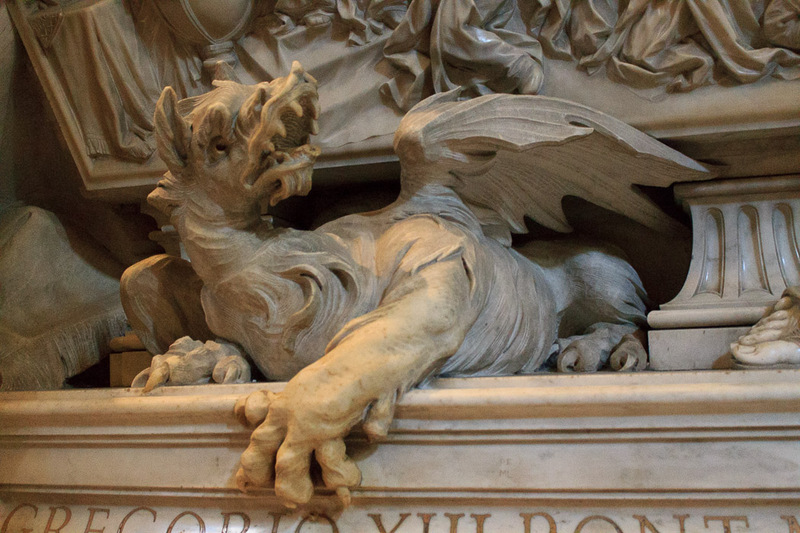 Just to the left of the entrance to the chapel is Bernini's "Monument to Gregory XIII" (1st and 2nd photos below), which I like because of the dragon at the bottom, which is a figure from Gregory XIII's family coat of arms. 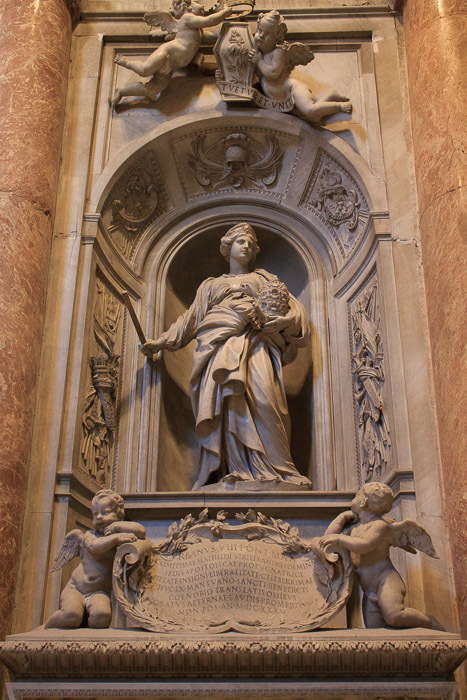 To the right of the entrance to the chapel is Bernini's "Monument to Matilda of Canossa" (3rd photo below). 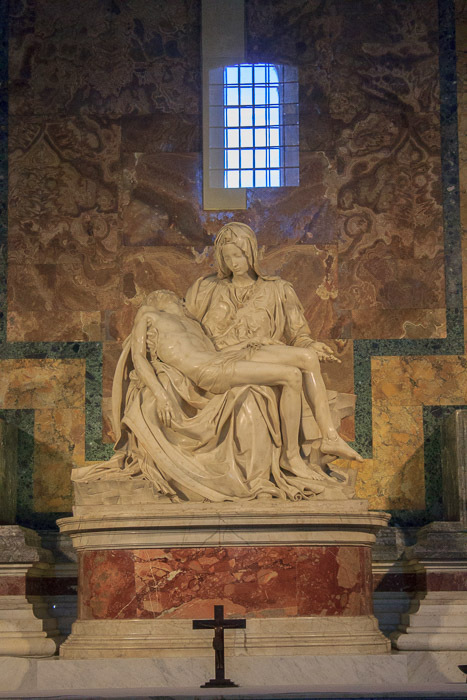 That leaves only the most famous, and unquestionably most beautiful, work of art in the church, Michelangelo's "Pieta" (both photos below), in which the dead Christ is held by his mother Mary. Michelangelo carved it when he was only 24 years old, and this is the only work he ever signed. 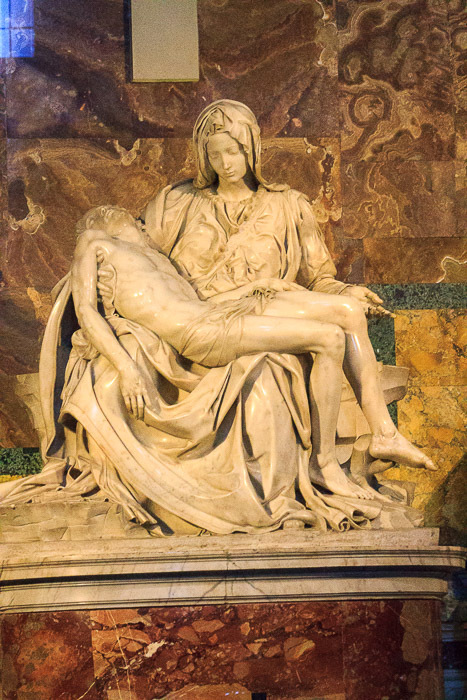 Pieta means pity, and Michelangelo captured the feelings of this moment when Mary cradled her crucified son in her lap. SaintPetersBasilica.org does an infinitely better job of explaining and describing everything about St. Peter's Basilica and its environs than I can do.